Ilyumzhinov Beats Kasparov 110-61 at FIDE Presidential Elections. 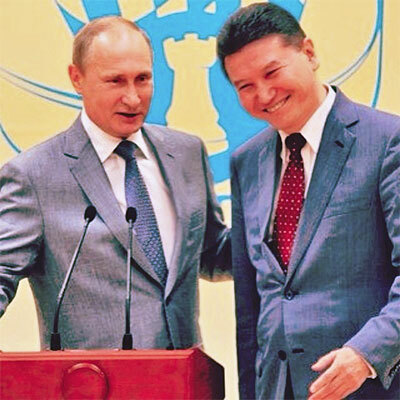 The President of Russian Federation Vladimir Putin congratulates Kirsan Ilyumzhinov on his re-election to the post of FIDE President. Let me congratulate you on your re-election to the post of the FIDE President. The election victory was a convincing evidence of the high esteem of your fruitful activity as the President of FIDE, well-deserved reputation in the global chess community. Largely thanks to you and your energy, competence, good knowledge of what you are doing - FIDE increases its uniting potential, makes a serious contribution to the organization of major tournaments and Championships, does much to the popularization of chess in our country and abroad. Dear Friends, Dear Chess Enthusiasts! Yesterday, I was re-elected as President of FIDE. 110 countries voted for me and I am grateful for their support. Now we have a lot of work ahead of us, and it will affect not only federations and professional chess players, because chess is more than federations: it’s over 500 million people around the world who play chess and respect its values – educational benefits, strategic thinking, intelligence and will to win. In the next four years I plan to see chess complete its transformation from a centuries-old game into a modern and exciting sport and a strong educational platform. Chess is already installed on more than a billion devices – smartphones and computers. It’s a golden age for chess. What are the chess fans to expect in the near future? An exciting World Championship match between Magnus Carlsen and Vishy Anand will take place in Sochi in November of 2014, and for the first time FIDE will put a lot of effort in making sure that it’s represented in social networks as well as on TV and online. You will be able to follow the match and witness how the greatest chess players prepare for the games and see each other, all via your mobile device and your favorite social network. We have also developed and will provide federations with an innovative ‘chess in schools’ solution that includes a unique chess schoolbook with hundreds of illustrations, an interactive technology, ways to design the chess classrooms and other educational devices that will help children fall in love with chess. As always, I will be working with federations and country leaders to ensure that chess is becoming part of the school curriculum in the countries around the world. Chess is a sport, and I will continue my efforts to include it in the Olympic family. Many countries already support chess as part of the Winter Olympic Games and I hope that soon chess will be an Olympic sport. Chess is one of the most democratic sports, available to all. It does not require expensive equipment. Our job is to make it even more accessible in all counties, including the poorest regions of the world. It’s well known that chess fosters development of intellect, strategic and math skills – those that in turn foster economic prosperity of nations. In 2012 and 2013, I visited over a hundred countries. I am moved by the volume of invitations and intend to continue visiting countries as President of FIDE. In each country I try to work with ministries of education and sport to help with chess tournaments and develop ‘Chess in Schools programs’. When I announced my campaign for FIDE president on October 7 in Tallinn, I stated that my goal was to elevate our game to the very high level in the public mind where I believe it belongs. On August 11 here in Tromsø, I lost the election for FIDE president, but my campaign did a tremendous amount of work around the world to elevate chess. In those 307 days, an incredible team came together, from my FIDE ticket to federation officials to staffers and volunteers around the world. I could not be prouder of their hard work and true passion for chess and for helping others. If the result of this election threatens to make me lose my optimism for the future of the chess world, thoughts of all these capable and compassionate people will bring it back. I also want to express my appreciation to all the fans who did what they could, from writing to their federations to being active on social media. We may not have changed FIDE but we have changed the world of chess for the better and will continue to do so. My thanks also to my generous sponsors and donors who made this ambitious global campaign possible. My campaign was about expanding the horizons of the chess and securing its future, our future, in a world with ever-increasing competition for our attention. My themes were bringing sponsorship, education initiatives, and new technology into the game and empowering the national federations. I do not for one moment believe that this election result indicates a problem with this platform, or with the exemplary individuals on my ticket, or with our many successful activities. The sad conclusion is that working hard and having big ideas and investing millions of dollars for the global development of chess all has very little to do with winning a FIDE election today. It was this disastrous situation that my team and I set out to change. I was never naïve, of course. I knew from the beginning that chess politics, especially in FIDE, had been steadily taken over by people who have little interest in the success of chess and chess players, but only in expanding their own power. I hoped that there was still a chance for a coalition of reform-minded federation leaders and others tired of broken promises and stagnation to reach a winning number of votes. The fact is that we fell far short and the result demonstrates that the rot is even deeper and more widespread than I believed back in October, or even on the morning of the election. I used my candidate’s speech to the General Assembly to present my vision of a FIDE that supports the federations so that they may grow strong. No one could doubt the sponsorship plans I spoke of were real because they had seen them in action during my campaign. Ilyumzhinov then used his speech to mock me and to mock everyone who cares for chess with outlandish promises everyone in the room knew were lies before his words stopped echoing in the auditorium. I knew at that moment that speeches didn’t matter in this election, just like the promotion of chess doesn’t matter to this FIDE administration. Ilyumzhinov could say anything at all and his supporters would cheer. Their votes had been decided long ago and the well-being of chess was never a significant part of this decision. 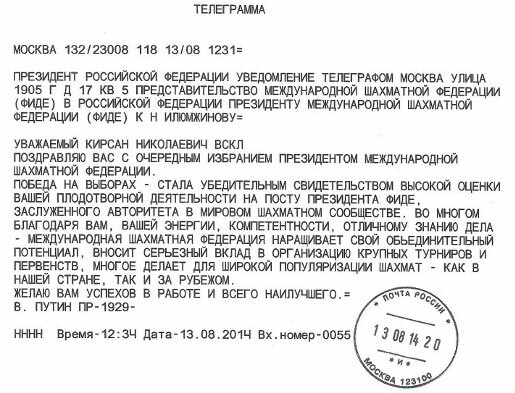 I immediately regretted my peaceable and reassuring speech – and that I had spoken before Ilyumzhinov. How I would like those 15 minutes back to instead condemn the corruption that has poisoned our sport for nearly two decades and to heap shame on the delegates who are so eager to vote for their own interests instead of the interests of the chess players in their nations. Such a speech would likely not have earned me any more votes, but it would have been more honest and I would have felt better then and now. I faced three main challenges in this campaign. First was the FIDE machinery, the abuse of power that made votes disappear and turned commissions into puppets. This was not a surprise, but I believed at the start that I had enough resources to overcome it and I probably did. There were two other factors I badly underestimated. I anticipated the Kremlin’s involvement but couldn’t imagine its extent or how susceptible Europe would be to it. Nor did I anticipate how resistant even many of the biggest federations are to change. They saw it as a threat and looked for excuses to maintain the status quo. These last two factors in particular eroded the base I thought I had at the start, a base of anti-Kirsan, anti-corruption, pro-growth federations with democratic traditions and substantial numbers of chess players with interests to protect. Perhaps that base still exists, but it is very small now and nearly every federation is eager to do a little business with Ilyumzhinov’s emissaries come election year. I guaranteed money in exchange for effort and sponsorship in exchange for activity and events. It’s clear that many prefer money with no responsibilities and no activities, regardless of what this means for chess. While Europe is becoming a lost continent, during this campaign I truly discovered Africa. I was so impressed by the players and teachers and leaders I have met from Abuja to Zanzibar! They aren’t afraid of change; they seek it out and fight hard for it at every step. Hard work is never wasted and while we did not win the day here in Tromsø, their passion is already transforming chess in Africa and soon it will transform the world and I will be proud to play a part. Our fight is not over. As Nelson Mandela wrote, “The greatest glory in living lies not in never falling, but in rising every time we fall.” Africa Rising! It is fitting that the slogan on my posters here in Tromsø was “Kasparov: the future of chess” and not “the future of FIDE.” Eventually, growth and change in the chess world will change FIDE; it is clear that FIDE cannot change itself. More numbers and more effort will be needed at the grassroots level. Lovers of chess must become administrators of chess. I spoke often of building up the base of players to raise up the entire chess world and this is just as true in chess politics. More good people coming in will eventually push more bad people out. You can go and do it! Find a way to fight for chess! People must work in their chess communities and change their federations so that our great game has the representation it deserves. My thanks again to all my team and supporters, and to our excellent hosts of the last two weeks here in Norway. The summer sun never sets in Tromsø and the sun will never set on the game of chess.